I sometimes have to thank my neighbor, Mark Hall, an unapologetic hophead who scours area tap lists for the stickiest IPAs he can find. He often discovers beers that my own travels don't reveal. Such as Laurelwood's War Horse, which is on tap at the Horse Brass and likely other spots around town. The name of the beer is so similar to Laurelwood's flagship beer, Workhorse, that I figured it must somehow be connected to the recent arrangement in which the Craft Brew Alliance is brewing and bottling Workhorse (and Free Range Red) in 12 oz bottles. Indeed. Part of the deal with the CBA was to see that the contract-brewed version of Workhorse matched what they were producing at Laurelwood's own brewery. That can be a challenge when you're moving to a significantly larger and functionally different brewing system. It took several test batches to dial in the recipe. That's where War Horse comes in. 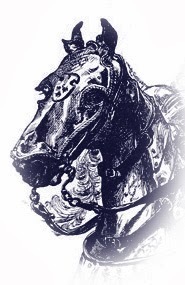 "War Horse was the first CBA trial of Workhorse," said Vasili Gletsos, Laurelwood brewmaster. "It finished high, a little sweeter then Workhorse, enough so that we didn't want to release it as Workhorse. It's really nice, similar style wise. We called it an Imperial Pale Ale, since without the attenuation, it fits a bit better as a strong pale." The difference in finishing gravity between Workhorse and Warhorse isn't huge...a degree higher Plato, resulting in about a half a point difference in ABV, according to Gletsos. That small difference would have put them out of spec for the stated alcohol on the label. They wanted and needed to dial in the Workhorse recipe a bit more. But they suspected people would like that first effort, so they released it as War Horse. If you are a fan of Workhorse and similar beers, you owe yourself a taste of War Horse. The aroma and flavor are fantastic. The marginally sweeter backbone seems to embrace and bond with the aroma and flavor. It may be an Imperial Pale Ale, but it's a serious hop bomb worthy of any hophead. Where can you find War Horse? They aren't pouring it at any of the Laurelwood locations. "We only tap beer produced at our brewery," Gletsos said. "It's possible we will at some future point carry CBA-produced seasonals. But not yet." War Horse has been on at the Horse Brass for a week or so, I guess, and it was on Thursday evening when I stopped by. The beer was distributed by Laurelwood's distribution partners throughout Oregon and Washington, so it's out there for the finding. The bad news is War Horse is a limited release. They don't plan to brew it again. Get some now!